I recently received an email about a movie that looks pretty entertaining. Check out the trailer and information on the film and its release dates below. 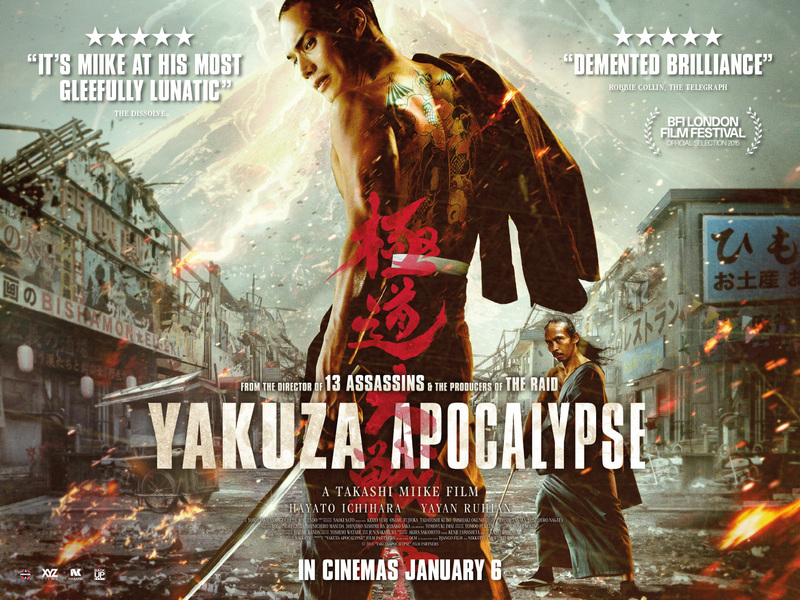 Manga Entertainment is excited to announce a UK theatrical release of cult Japanese director, Takashi Miike’s latest cinematic feast, Yakuza Apocalypse. The film, which recently wowed audiences at the London Film Festival and had its world premiere at Cannes Directors Fortnight is coming to UK cinemas January 6. In what The Telegraph’s Robbie Collin refers to as ‘demented brilliance’, the film is arguably the craziest vampire-gangster genre mashup ever witnessed. Miike’s signature blend of deranged horror, slapstick and action are all on display here, making Yakuza Apocalypse not only his most fun film but also the most bizarre to date. Yakuza Apocalypse tells the story of Kageyama who is ridiculed for being the only member of the Yakuza clan unable to brand himself with their signature tattoo due to sensitive skin. However, when a dying Kamiura, the most feared boss in the Yakuza underworld, bites Kageyama he is transformed into a bloodthirsty monster who will stop at nothing to avenge his former boss. Synopsis: Due to his sensitive skin, Kageyama is ridiculed by his fellow Yakuza clan members for being the only one who cannot be branded with their signature tattoo. When Kamiura, the fearsome Yakuza boss who also happens to be a bloodsucking vampire is brutally killed by a competing clan, he passes on his vampire powers to his loyal lieutenant. Now Kageyama is transformed into a bloodthirsty monster who will stop at nothing to avenge his former boss. This entry was posted in ModBlog and tagged Movies, Tattoos by Jen. Bookmark the permalink.